The massive housing stock from the second part of the twentieth century needs a fundamental upgrade in terms of materials, utilities and modes of ownership. 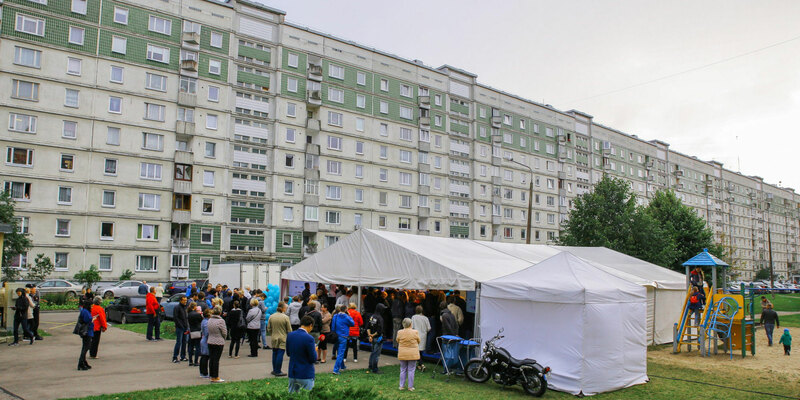 The EU-funded programmes for energy efficiency in Latvia is intended to meet the growing demand for renovation, yet its lengthy implementation and limited scope exposes the disproportionately large amount of buildings in poor conditions. ‘The Great Wall of China’ is a nickname for a 500 metre-long block of roughly 400 flats that house about 1000 people in one of Riga’s large-scale residential areas. The epithet connotes the distorted relationship of scale and size inherent in Soviet architecture, marking its tradition of social divides, alienation and emptied open spaces. In September 2017, the building was in the spotlight because of an event to raise public support for EU-funded energy efficiency measures. A state-owned development financial institution – ALTUM – and the Ministry of Economy manage the implementation of the energy efficiency improvements for the multi-apartment buildings, with financing provided by the EU’s European Regional and Development Fund. These EU funds are the largest share of the state budget available for co-financing energy efficiency measures in the mixed-ownership residential sector. During the budget period for 2014-2020, around 1000 projects totalling more than EUR 176 million EUR are planned. According to the Ministry of Economics, 20 000 buildings urgently need improved energy efficiency performance (deep renovation), which would cost an estimated EUR 5 billion. Yet the implementation of renovation and energy efficiency measures is rather slow, given the amount of housing units across the country. So the story of one massive building draws attention to the many obstacles encountered in renovation projects. Technical improvements usually bring about better energy performance, and the costs are covered by a decrease in utility bills. However, there is often no agreement among the many owners of multi-apartment buildings about how to proceed with a project application. To receive public funding for up to 50 per cent of selected project expenses, complex contracts are needed to define the obligations of all parties involved. ‘Let’s live warmer!’ is the leading informational campaign from the Ministry of Economics about energy efficiency initiated in 2010 to coincide with the previous EU-funded energy efficiency programme to renovate 760 multi-apartment buildings. Over the last few years, ‘Let’s live warmer!’ has convened a number of presentations, publications and discussions devoted to promoting the renovation processes and procedures in Latvia. This outreach to diverse social groups of homeowners offers two insights: a public resistant to self-organisation for achieving progress and an administration enacting complex technical procedures. At the same time, housing and maintenance firms, construction companies, engineers, banks, and managers are as well dominant actors in these schemes, and the links between the disintegrating built structures and public funding for their improvement must be established in spite of different interests, resources and capabilities. The first successful renovation project in 2017 was a five-story house in the Kurzeme region. It was the last one in a group of five now well-insulated buildings. To see remote places connected in an effective way does not always need government involvement. The housing company that coordinated the projects attributes its success to evidence-based persuasion methods and direct social interaction among neighbours. Motivations to join renovation projects are varied, and the demand for better and more accessible funding schemes is growing. Yet the dominance of inefficient buildings, fixed expenses and rigid energy consumption patterns are a major problem, as are tight administrative burdens and social inequality. Through the efforts of civil society and others, resilient and more efficient cities are possible, but also more difficult because of the old and new walls that make up the economic and built structures in the shared experience of common good.